This is a well-conceived, ambitious book. It has already appeared in German and French, and will appear in Spanish and Italian. The authors are an international group, although there is a preponderance of authors from the United States. The goal of this presentation is to offer the divergent “challenging” thinking of the exponents of analytic group psychotherapy, Thirty-two authors were approached for original manuscripts; ten are presented here. This approach has had the advantage of bringing together thoughtful and thorough statements of perspective on the theoretical underpinnings of the practice of group psychotherapy. It has apparently had the disadvantage of long time delays as the authors organized their thinking there is evidence, for instance, that some of these presentations were written at least ten years ago. For the most part, however, the presentations seem not to be time-dependent. 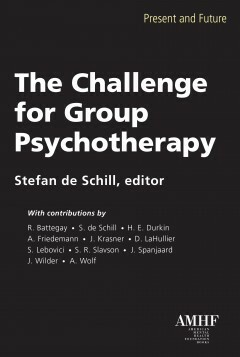 The field of group psychotherapy has recently been confronted with a great expansion and the popularization of technique over theory. The variety of activities advocated for groups has overshadowed the need for the group leader to have a conceptual framework in mind. This book is a refreshing antidote to this problem because it emphasizes the importance of concepts of psychodynamics in relation to the changes induced in groups. There are contradictions among the various authors, but each is explicit about the factors he takes into account in considering his his method of group psychotherapy. The total impact of the book is useful for the reader, who can absorb each of the constructs in turn and then build his own conceptual framework in relation to what he has learned here. The book lacks outcome studies and case presentations are minimal, so this is not the place to look for studies of the effectiveness of various treatments. Actually, the world “challenge” in the title of this book seems to be gratuitous. The titles in German and French avoid the term and are more in keeping with the content of the volume, which is a straightforward presentation of ten conceptual statements by individuals obviously grounded in psychodynamic and psychoanalytic thinking in relation to their methods of applying theory to groups of patients. The book is recommended for individuals trying to improve their understanding of the dynamics of personality change in a group setting. Each of the authors reveals the usefulness of the group itself as a mechanism for helping the therapist learn about himself. The need for the therapist to be aware of his own characteristics and the impact they have upon his patients is made more explicit in group than in individual therapy; the authors clarify the advantages to the therapist as well as to the patients of their group therapy practices.—Jay W. Fidler, M.D.